HitTheLights is not the application that you should install on your PC. The program does not offer authentic services, and so it should come as no surprise that we recommend deleting it from your PC. If you do not follow our advice and install the program, you probably expect it to “turn off the lights when watching videos on your favorite websites.” Our malware researchers have analyzed the app and have discovered that it does not work in that way, and so the removal of HitTheLights should not be postponed. You can download HitTheLights from hitthelightsapp.com, or you can download it via software bundles. 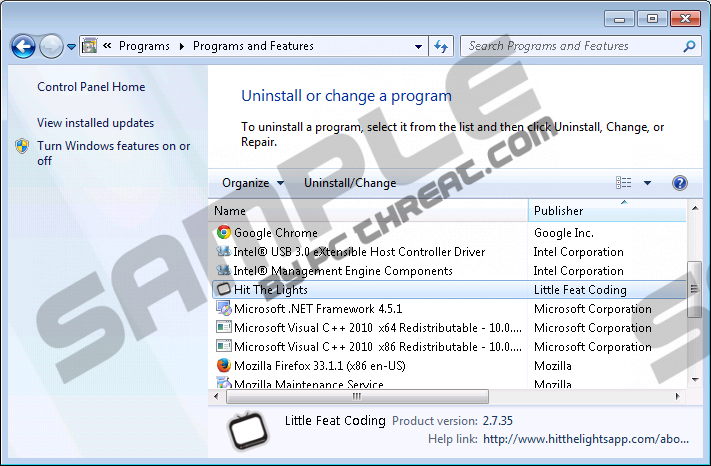 The application created by Little Feat Coding could be distributed using third-party installers, and these could represent a bunch of unreliable programs that we might recommend removing as well. If you do not want to have to worry about the removal of various malicious, intrusive programs, you need to make sure that you do not install them in the first place. Luckily, HitTheLights is not the most dangerous threat that could attack. The clones of HitTheLights include Web Guard, Web Shield, Websteroids, and Blasteroids, all of which must be deleted as well. These and many other clones are usually associated with different developers; however, we have a suspicion that they all belong to the same company, because the websites representing them are all similar. Furthermore, these programs do not work the way they should and, instead, they produce advertisements. You must delete HitTheLights to make sure that these ads stop flooding your browsers. The advertisements are loaded by a running process called HitTheLightsService.exe. It is most likely that as soon as you terminate this process, the suspicious advertisements will stop showing up. However, this will not stop all of the activities initiated by HitTheLights. This program might continue collecting data about your browsing activity until you remove it from your PC. Even though this sort of activity does not appear to be highly malicious, we strongly recommend deleting the suspicious advertisement-supported program. Have you decided to delete HitTheLights from your Windows operating system? If you have, go ahead and follow the removal steps that we have provided below. Of course, these guides have not been designed to help you remove other programs, and if HitTheLights has been installed on your PC bundled with malware, you might have trouble removing it manually. Do not stress about this and simply install a reliable automatic malware removal tool that will delete all of the threats for you. Navigate to the left of the Taskbar and click Start to open a menu. Go to the Change or Remove Programs menu and Remove HitTheLights. Quick & tested solution for HitTheLights removal.